This is a serious serious book! 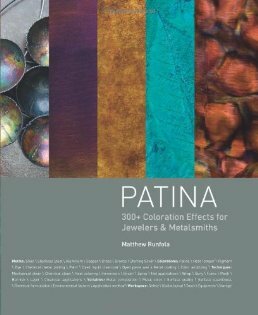 Matthew Runfola has written what might well become the bible of Patina, which details over 300 patination recipes for all different types of metal (steel, stainless steel, copper, brass, bronze, silver, and aluminum). Packed with charts and forumulas that will make your decision-making process easier, the book is arranged with information up front, followed by a directory of samples, and finishing with the recipes used to create those samples. Safety is of great concern when you're working with metals and with chemicals, and Matthew devotes a chapter to the safe use of your tools and equipment, and to setting up a safe work area. He then turns to aesthetic concerns, discussing the importance and effect of finishing techniques, a comparison of coloration methods, and factors that can/can't be controlled in the coloration processes. The next section is devoted to the technical aspects of working with the different coloration methods. Matthew covers surface preparation through mechanical and chemical means, preparing colorants, applying heat oxidation, cold and hot immersions, brush and spray applications, hot application, wrapping and burying, fuming, masking, burnishing, and layering. It's a lot of very technical and precise information for all skill levels. And finally, organized by metal type, the patination directory (followed by formulas) is about half of the book. The samples are large enough to study, and of course they are in full color. 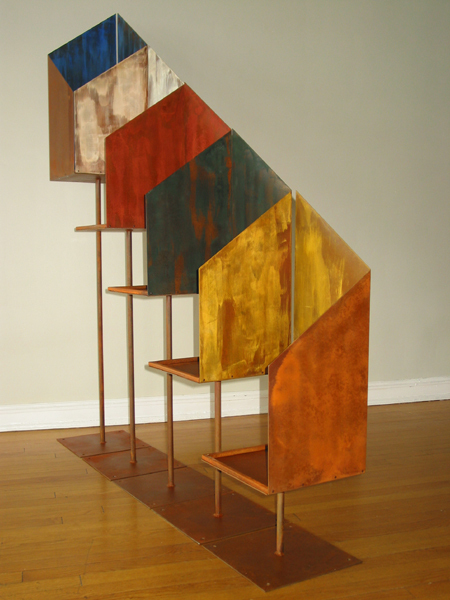 Interspersed throughout this amazing book are beautiful examples of colored metal pieces by various artists. The piece shown above is by Matthew Runfola (not in the book), and is called Prayer Flags no. 2. It is made from steel with various patinas. In the book are more examples of sculpture, jewelry, and mixed media art. If you are serious about metal, this is a book that you will treasure as a reference.